I’m working on a new browser for web developers and designers, called Polypane. It’s cross-platform (Windows, macOS and Linux) and really really cool. Head over to Polypane.rocks to sign up for the beta. Polypane is the browser that I as a web developer and designer want to have when I’m building a website. Developing a website and making sure it looks great on a bunch of different screen sizes is a lot of work, and current browsers don’t make it any easier. 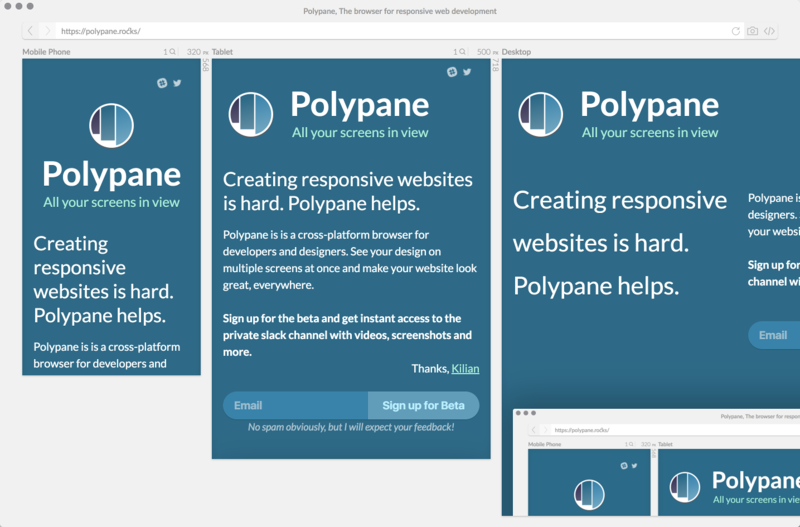 Polypane lets you see your website in a whole range of screen sizes (you choose, including zooming) without you having to sacrifice everything else you as a developer want, like DevTools. It also includes other functionality, such as letting you export a screenshot of all screen sizes. This makes it super easy to get signoff or do some last checking. I’ve been working on Polypane since May 2015, and it’s ready to share with people today. Sign up for the beta on Polypane.rocks, and you get immediate access to the private slack channel. When will pixels become obsolete?